Grab your best pals and join us for an amazing evening of live competitive painting as artists have 20 minutes to take their canvases from blank to beautiful, battling not only the clock but each other as well. Watch the paint fly before your eyes and help vote to determine the Champion! 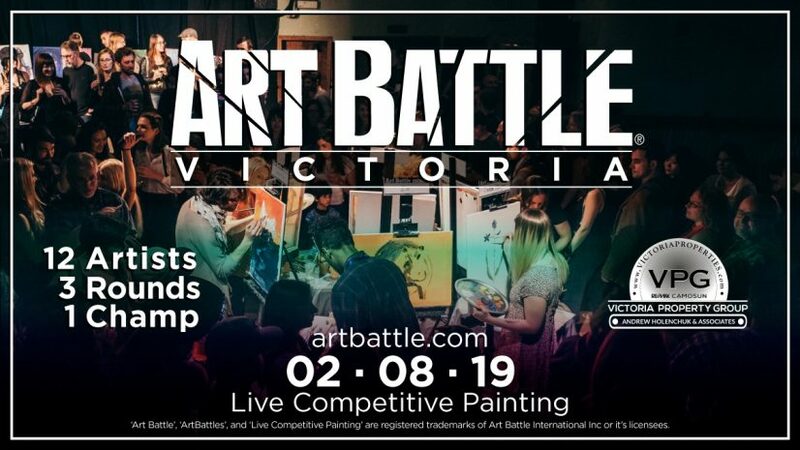 *Art Battle Victoria is proudly sponsored by Victoria Property Group – Andrew Holenchuk & Associates! AB is in its 5th year in Victoria https://vimeo.com/182946457/ with events held on a monthly basis at the Victoria Event Centre! * The Victoria Event Centre no longer has an operational elevator, and there is one long flight of stairs at the venue entrance. If you would like to attend the event but require assistance with accessing the space, please contact us at events@victoriaeventcentre.ca and we will do our best to accommodate. * Washrooms are all genders.